I love preserving things. 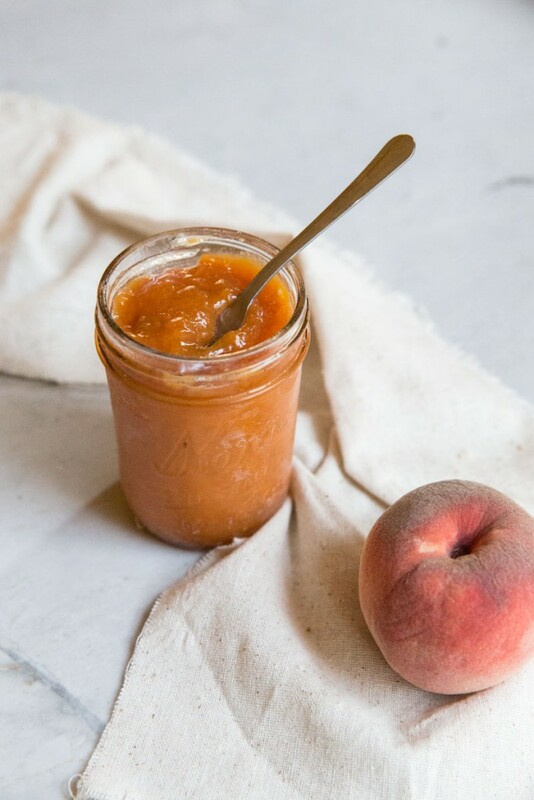 Every year it seems like I come up with a new recipe or way of preserving and peaches are easily my favorite summer item to preserve. 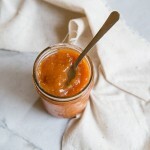 I’ve canned peaches in honey simple syrup and made several versions of peach jam and peach butter. I’ve frozen peaches slices and even made freezer peach pie filling. This year, I chose the freezer as my preserving method of choice. It’s simply easier and quicker. Speaking of the art of freezing things (it’s not really an art form!) I have some fun news… I’m writing another cookbook! It’s all about Freezer Foods – cooking with frozen foods, best practices of freezing, and using the freezer to preserve. This subject couldn’t have come at a better time of life for me. As a mom of a toddler, though I’d love to make elaborate meals and spend hours in the kitchen canning summer produce, that’s just not a reality. Now freezer-jam, that’s something I CAN do! Once the contract for this book was signed, or even before, my mind was spilling over with ideas. Most of all, I was thinking of all of my dearest friends with one or more children, or pregnant, or working with kids, and how this could make all of our lives a little bit easier. This book isn’t going to be filled with your typical freezer meals through there will be a few baked dishes and casserole type meals, it will have tons of ideas for making large quantity dishes and storing half or more in the freezer. It will include snacks, think unprocessed snacks instead of all of the carbs we often feed our kids because its just easy and accessible, and plenty of stocks, sauces, and soups. With a few days work you’ll be able to even produce a pretty fancy meal with ingredients straight from your freezer. Okay, enough freezer talk. I just couldn’t wait any longer to share the news. Think of me the next time you open your freezer 🙂 I feel like I’m getting ready to hibernate this winter! This freezer jam takes almost no effort at all. Once the peaches are peeled there’s almost no active tasks to complete the recipe, you simply need to be present to complete it. Once its finished all you have to do is throw it into the freezer and have enough patience to wait for winter to roll around to enjoy it. Or keep one jar in the fridge to enjoy right away! 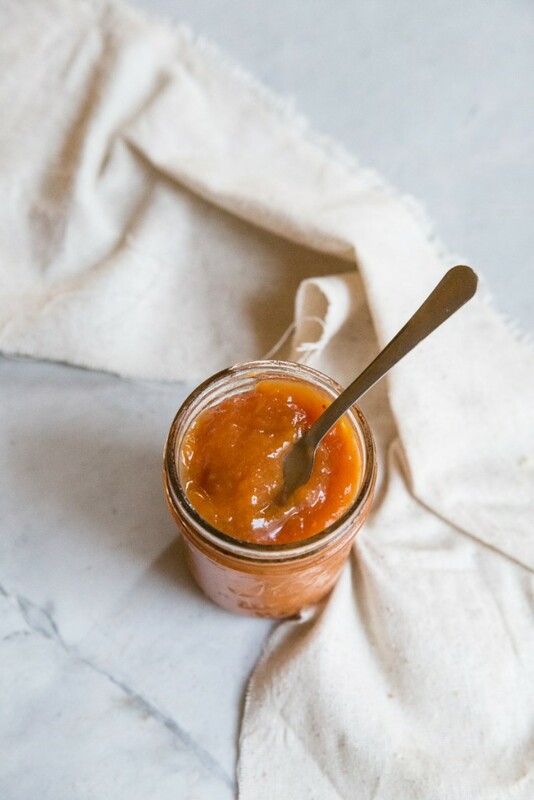 Making Peach Freezer Jam is an easy way to preserve summers best flavor! To peel the peaches, bring a large pot of water to a boil. Score (barely slice in an x) the bottom of each peach. Place peaches in boiling water and remove once the skin from the x starts to peel back (about 1 minutes or less). Place hot peaches in a couple large bowls of ice water to stop them from cooking. Once cool, peel the skin off the peaches. Slice peaches into quarters then place in a large bowl. Squeeze lemon juice over the peaches then sprinkle the cup of sugar on top. Let the peaches macerate (get juicy) in the sugar for 1/2-1 hour. Transfer the peaches into a heavy bottom pot. Add the honey and salt. Bring to a simmer then cook for 1 hour or until desired thickness. Use a wooden spoon to occasionally stir and prevent the jam from sticking to the bottom of the pan. 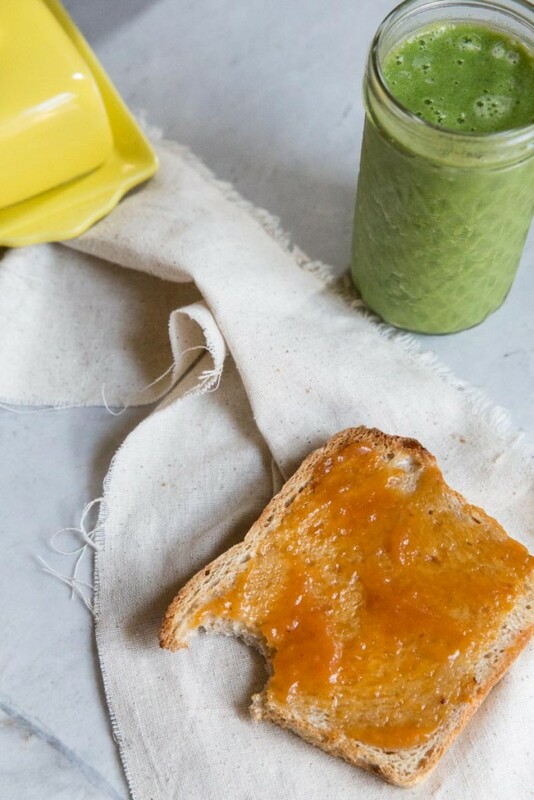 Use a blender or immersion blender for smooth jam. Transfer to 3 8 ounce jars that are freezer safe (straight edges) or to freezer safe plastic containers. 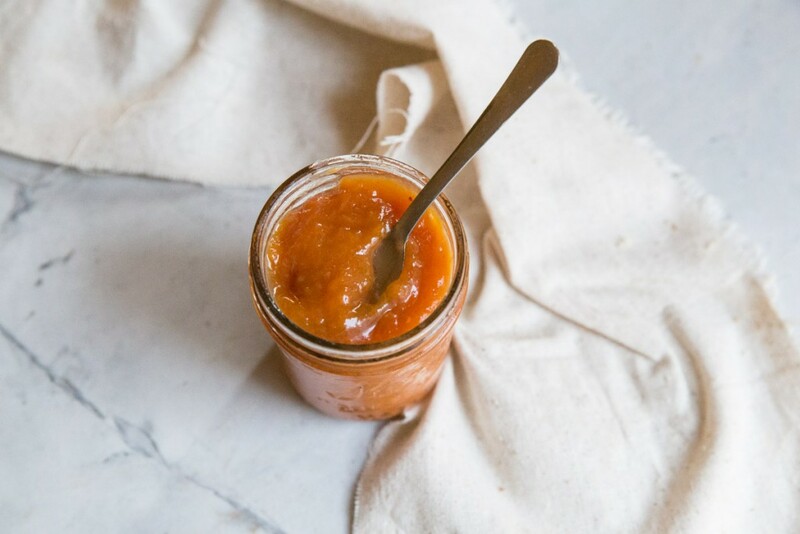 The great thing about freezer jam instead of canned jam is that you don't have to be exact with the recipe and you don't need loads of sugar to preserve the fruit. Just enough sugar is plenty and alter to your own preference! That is just fantastic! Congratulations. What great news! I can’t be more thrilled for you. I can’t wait to see the book – so exciting!! And so many congratulations, friend!! Thanks so much Megan. Hope all is well for you!! Such a great idea for a cookbook. I can’t wait to use it. thanks so much Barbara! It really has been fun to experiment with freezing.